Yay! Fall is here! My absolute favourite season! I have been looking forward to this season for many reasons; sweaters, blankets, fresh apple cider, cooler days, cool nights so one can snuggle under blankets. Another reason is so I can decorate for Fall! 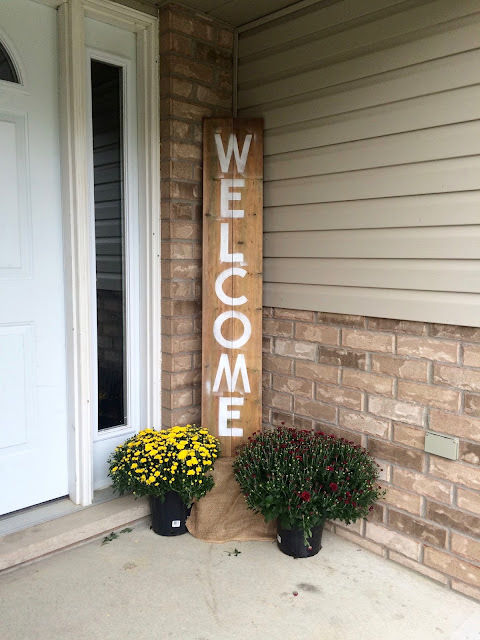 This year I made a welcome sign that I can use in any season and added some burlap and mums, hopefully some corn stalks and a pumpkin will be joining my arrangement as well. I haven't got to make my centre piece for my table but here is what I have in mind! These are just the few simple ideas that are easy but look so pretty! If you do a search on Pinterest or even good ol' Google you are bound to find a ton of different ideas to suit your style! A small touch of seasonal decorations makes a home look so inviting and homey! So try your hand at making a few no matter how "crafty" you may or may not be.